picturesque with its brightly coloured tower-houses and steep, narrow alleyways (carrugi ) leading to the seafront. It certainly feels like the quietest of all the five towns of Cinque Terre and it even appears to keep its peacefulness even during the busy summer months. This enchanting spot also has a long tradition of producing wine and olive oil. Above Manarola, on the hills you can admire the typical terraces with vines used for the making of the renowned dry, white wine of the area - sciacchetrà. Worth a stop is also the small museum dedicated to wine. In the lower part of town, before splashing into the blue water of the tiny harbour, you can also visit and admire the old oil mill which was restored by the National Park. If you are looking to buy some olive oil to take home from the Cinque Terre, look no further than Manarola. 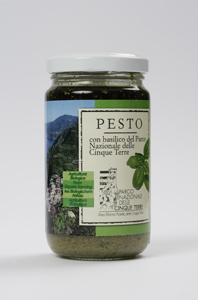 Also look out for the Cinque Terre National Park’s Pesto Sauce with Basil which comes from the project to recover uncultivated lands. It is produced within an hour of harvesting the basil leaves, which are grown on the Corniolo coast between Riomaggiore and Manarola and is a real feast to the taste buds ! Manarola’s tiny harbour is nested in between two rocky boulders and is formed by a terraced promenade. There is a tiny piazza where you can sit, enjoy the atmosphere and taste some great seafood. Along the main road of Manarola Cinque Terre, you will often encounter boats pulled out of the water onto dry land every time the sea is rough. Although there is no real beach in Manarola, you can enjoy some of the best deep-water swimming around the area. In the high part of town, above the houses, you will find the main square of the town called piazza Papa Innocenzo IV. There you can visit the Church of San Lorenzo, dedicated to the Nativity of the Virgin Mary and built in 1338 in classic Ligurian gothic style. dating from around the 10th century. You can also see the peak of an unusual pyramid made of white cement rising over the traditional slate roofs of the houses of the old town, used as a navigational reference point for all those at sea. as its hills get illuminated by the lights of a unique nativity scene made of 200 figures and 12,000 lamps, created by a local resident, Mario Andreoli. It is considered to be the biggest illuminated nativity in the world and it remains lit from December 8th till the end January. One of the main attractions of the Cinque Terre are the spectacular walking and hiking trails around the area. From the station of Manarola, the steep stairs will lead you to the best-known stretch of the No.2 Path of the Cinque Terre between Manarola and Riomaggiore, called Via dell'Amore, "Lovers’ Walk" .